Last time I asked – where do I go for real references? I would love to tell you that there are tons of easily accessible, and inexpensive, books that you can just add to your library. But unfortunately it really is not that easy. As I mentioned last time, a lot of the earlier works on the Picts were of poor academic quality. 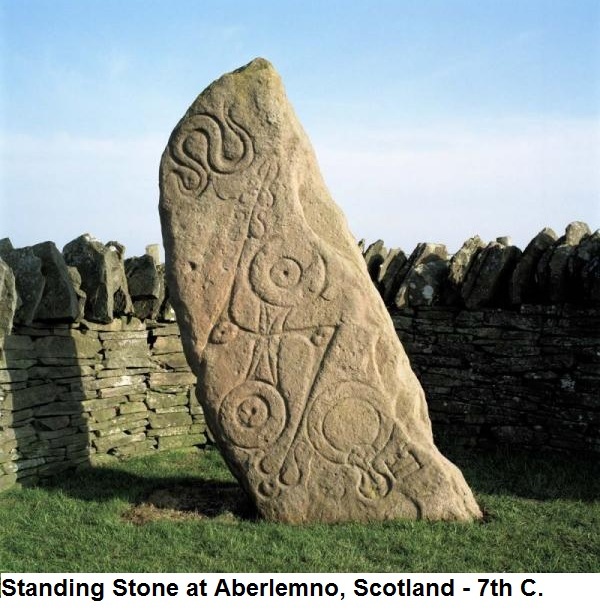 In addition many early studies of the Picts were focused 100% on standing stones and crosses. My own exposure to Insular Art began with Calligraphy and Illumination. Treasures like the Book of Kells, the Book of Durrow, and the Lindesfarne Gospels entranced me with their complexity and made me curious about the people who created them. But many of the manuscript studies that I have run across show no interest at all in the people who created them. Unfortunately almost no writings appear to have survived from the Picts. I keep hoping that some will emerge from the stacks in a university collection, but so far, it has not happened. There are a few Pictish inscriptions which were written in Ogham script, but we have no surviving literary evidence of manuscripts. At this point I need to mention a very important point. You may have noticed that I mentioned “surviving manuscripts”. We don’t know for sure whether there were any manuscripts to start with, but we do know that Protestantism did quite a bit of damage in the northern UK. The Governor of the Isle of Man visited Iona in 1688. He noted that a Reformation Synod had ordered “sixty crosses to be cast into the sea”. Another description, written in 1693, reported that “there had once been 360 crosses “which vas all destroyed by one provinciall assembly holden an the place a little after the reformation”. It really is impossible to guess how much was destroyed by zealots. The Pictish churches had, well before the Reformation, become completely Roman Catholic, with no trace of their Celtic origins, and therefore were subject to the purges of the Reformation and the Dissolution of Monasteries. So now what? While scrounging around online looking for sources I discovered Oxford Bibliographies. This is how they define Insular art. “Insular art is a poorly defined area. Broadly speaking, it refers to the art of the British Isles and Ireland between, roughly, the years 600 and 900 CE. In Scotland (which includes the art of the Picts, Gaels, and Scots), Ireland, and the Isle of Man, it is often extended through the Viking and Romanesque periods, into the 12th century, while in England it is usually understood as ending in or around the last quarter of the 9th century.” And then they give us a bibliography. You can’t see all of it unless you subscribe, but it is a start. I was delighted to discover, as I went through this and other sources that one of my favorite books “The Art of the Picts: Sculpture and Metalwork in Early Medieval Scotland” (2004) was highly regarded by many researchers. Next Time: Where Else Can We Go For Information?